It might seem to be a wonderful act of kindness. Why not set your pet free to live life in the wild, as nature intended? There are a lot of reasons that’s usually a bad idea. 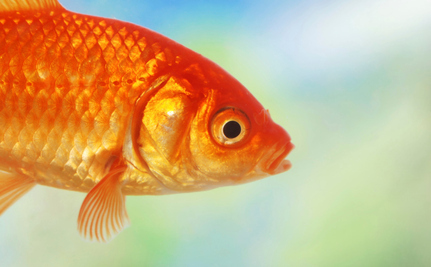 As it turns out, “setting free” even a few innocent goldfish sets in motion a damaging series of impacts. About two years ago, wildlife officials believe, some folks released their goldfish into Teller Lake near Boulder, Colo. You might think a few goldfish tossed into a big lake couldn’t possibly pose a serious problem. You’d be wrong. The aftermath of loosing these fish into a habitat in which they didn’t belong has become a cautionary tale worth heeding. Why? 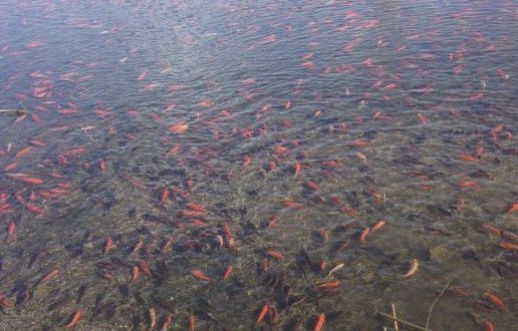 Because two years later, Teller Lake is teeming with 3,000 to 4,000 goldfish. That’s why. Yes, somehow — even though the goldfish you bring home inevitably die no matter how well you care for them — these guys learned to thrive in the lake. That hardy little group of pet fish had themselves a party, breeding and multiplying happily until they became a swarm that’s literally choking the life out of the lake ecosystem. Before they find their way into additional state waters, wildlife officials now have to come up with a plan to remove them before any further harm is done. Colorado Parks and Wildlife (CPW) has its hands full. Species native to the lake — sun fish, blue gill fish, channel catfish — are being crowded out by the goldfish, which are considered an invasive species in this context. The lesson to be learned here is simple. Never allow non-native species into an ecosystem. When you do, you can set in motion a domino effect you may never realize was your fault. This isn’t the first time officials in Colorado have had to deal with non-native fish. In 2012, CPW had to remove koi from Thunderbird Lake. Dealing with that problem uncovered 2,275 non-native fish inhabiting that lake alone. In 2008, officials found zebra mussels and quagga mussels in eight Colorado reservoirs. The problem isn’t limited to people setting their pet fish free. In many cases, people who love to fish attempt to stock their favorite fishing spot with the type of fish they prefer, whether or not it belongs there. CPW now must decide what to do to rescue Teller Lake. Options, unfortunately, include stunning the fish with electroshocks or draining the lake and collecting them up. Either way, they’re likely headed to a local raptor rehabilitation center where they’ll end up as bird food. There’s apparently no kinder way to deal with them. Though some locals have said they’d take some of the fish as pets, CPW worries that allowing that would be a bad idea. “I’m going to talk to Boulder County, who owns the lake to see what they think, but I don’t want to send the message that collecting fish for personal fun is okay,” Churchill told ABC News. Sadly, what may have been a well-meant act has created a serious problem. Think twice before doing something like this and discourage anyone who might mention releasing non-native species where they don’t belong. Every act has ramifications. Some are terrible. In Europe many larger cities have problems with city rabbits. They are non-native rabbits (I don't think there are any native rabbits in Europe, only hares) that have either escaped or been released. They are thriving in the green areas and breeding like - - - rabbits. Even in places where the temperature go well below zero in the winters. As is natural for their species, they dig burrows, and they also lure predators to their living areas - city foxes - that also use burrows. In places there are so many tunnels and holes under the ground that the structural integrity of the ground and some buildings is threatened. So it isn't only nature that invasive species can cause problems for. But with the rabbits and foxes humans face the problems as with other invasive species - how to get rid of something that has found it's own niche in the ecosystem and is thriving (at the expense of local species). And that is what happens when you mess up with nature! I thought by now everybody knew that releasing unwanted pets into an environment not meant for them was a very bad idea, but apparently I was wrong. There are still some pretty stupid irresponsible people out there. Unintended consequence, but good for the birds they plan to feed. Goldfish don't belong in that lake,so they or the person should not have put them in there.that is sad that the native fish that makes the area beautiful,and people could eat are now being destroyed.